If you want to position your iPhone for a photo and then take the photo from a distance, you can use your Apple Watch to view the iPhone camera image and take the photo. 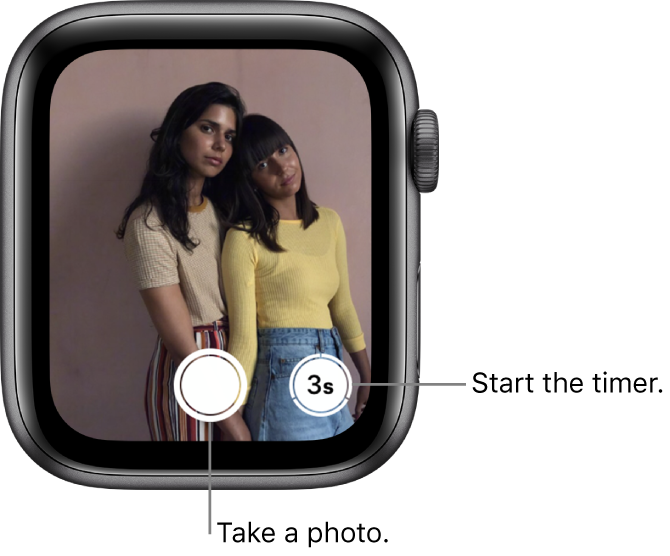 You can also use your Apple Watch to set a shutter timer—this gives you time to lower your wrist and raise your eyes when you’re in the shot. To function as a camera remote, your Apple Watch needs to be within normal Bluetooth range of your iPhone (about 33 feet or 10 meters). Open the Camera app on your Apple Watch. Position your iPhone to frame the shot using your Apple Watch as a viewfinder. To adjust exposure, tap the key area of the shot in the preview on your Apple Watch. To take the shot, tap the Shutter button. To take a Live Photo, firmly press the display, then tap Live . To see which devices support Live Photos, see iPhone User Guide. The photo is captured in Photos on your iPhone, but you can review it on your Apple Watch. Choose a different camera: To switch between the rear-facing camera and the front-facing FaceTime camera on your iPhone, open the Camera app on your Apple Watch, firmly press the display, then tap Flip . Choose a different camera mode: Open the Camera app on your iPhone, then swipe to choose Time-Lapse, Slo-Mo, Video, Portrait, or Square. Turn the flash on or off: Open the Camera app on your Apple Watch, firmly press the display, tap Flash , then tap Auto, On, or Off. Use the shutter timer: Open the Camera app on your Apple Watch, then tap the Timer button on the bottom right. Beeps accompanying a countdown, a tap, and flashes from your iPhone let you know when to expect the shot. Use HDR: Open the Camera app on your Apple Watch, firmly press the display, tap HDR , then tap Auto, On, or Off. HDR (High Dynamic Range) helps you get great shots in high-contrast situations. When shooting with HDR on, your iPhone takes multiple photos in rapid succession—at different exposure settings—and blends them together. The resulting photo has better detail in the bright and midtone areas. Note: HDR is available with the rear-facing camera on an iPhone and the front-facing FaceTime camera on iPhone 5s and later. Use the following actions to review your shots on your Apple Watch. View a photo: Tap the thumbnail in the bottom left. See other photos: Swipe left or right. Zoom: Turn the Digital Crown. Pan: Drag on a zoomed photo. Fill the screen: Double-tap the screen. Show or hide the Close button and the shot count: Tap the screen. When you’re finished, tap Close.